Through movement we become more aware not only of our surroundings but also of ourselves. 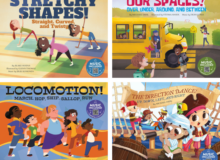 This interactive lesson uses music, dance, and language arts to explore the series concepts of movement, space, and direction. Students will have fun getting physical while exploring these topics. Get STEAMing: technology, science, and language arts extension activities are also included! Download or stream the Creative Movement songs for free!